I’ve been writing this blog for so long that recently, I’ve been writing blog posts for restaurants I’ve already written blog posts for. Some of the time it’s just because the last time I blogged about a place it has been close to ten years. Some of the time, I do it because a place has undergone a major change in menu or space. This particular post is about a place that has undergone a major change in both space and menu. 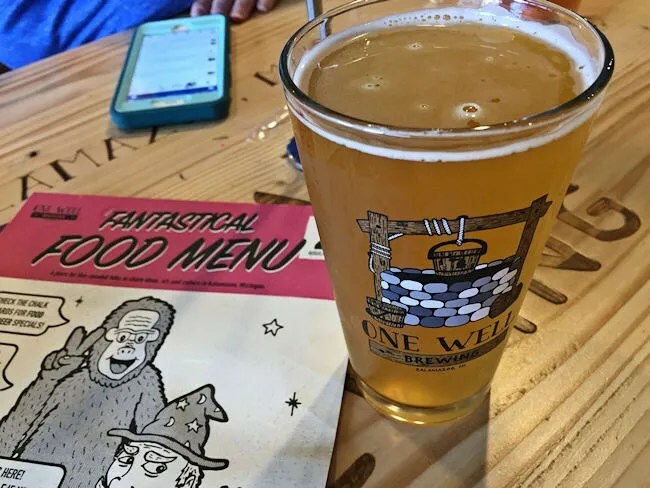 I first blogged about One Well Brewing not long after they opened their kitchen in 2015. At that time, they had a pretty limited food menu. 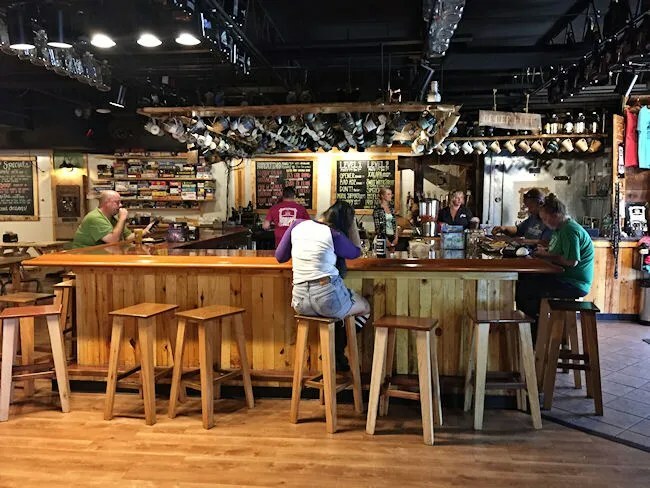 We enjoyed our visit, but we typically only visit breweries a second time if they have a good food menu and something for the kids. Things have changed pretty drastically in the last two years. 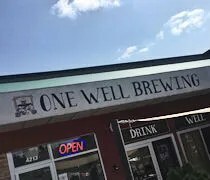 One Well Brewing is on Portage Road near the interchange with I-94. It’s in a strip mall that sits a little ways off the road between Bloomfield and Dorchester Avenues. 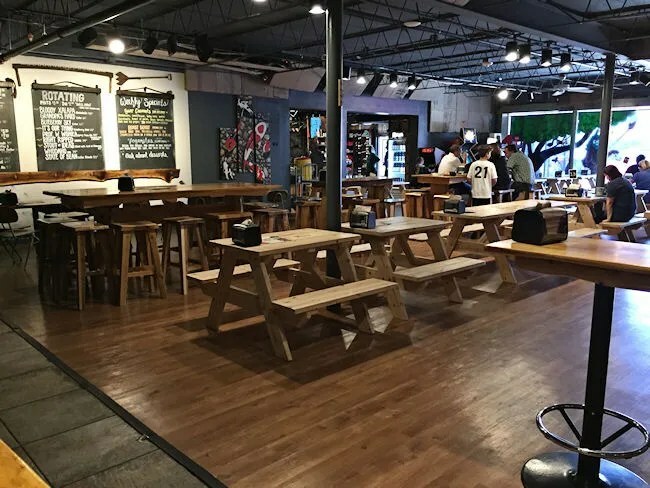 The space that One Well was a different brewery that didn’t last very long in the neighborhood because they thought there was too much crime. At least, that’s the space they were in last time we were there….I mean, they’re still in that space, but they’ve also expanded into the space next door which was a 24/7 gym….and this is the space that you really need to check out as you’ll see in a little bit. We stopped in for lunch around noon on a Saturday. You still enter at the same spot and you walk right in to an area with merchandise right next to the main bar. All ordering is done at the bar and they give you a number to take to a table. The bar is a pretty large horseshoe bar that takes up a big part of the entryway to the restaurant. The bar is fronted with wood paneling and there are wooden bar stools all the way around. 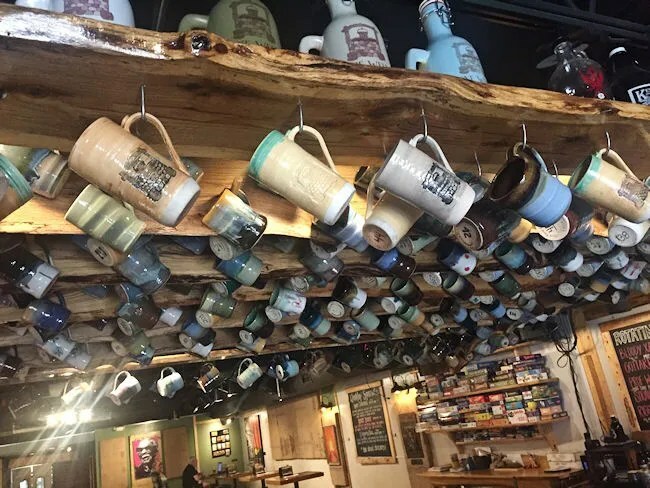 Above the bar hangs the mugs for the mug club. It always seems weird to me people drink beer out of ceramic mugs…but then again, cans felt weird until I started doing it regularly. J had just been to One Well with a group of moms a few days earlier so she pretty much knew what she was getting, but I had to grab a menu. 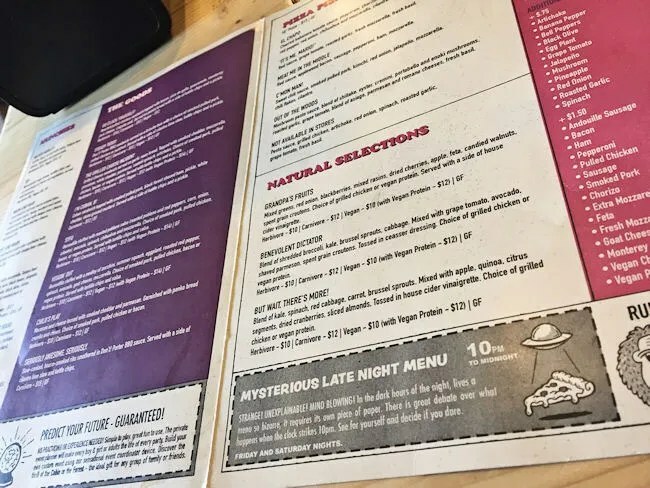 The menu still isn’t huge, but they have a lot of good stuff on it. The pizzas are still around from the first time we ate there but there are a lot more sandwich selections now. 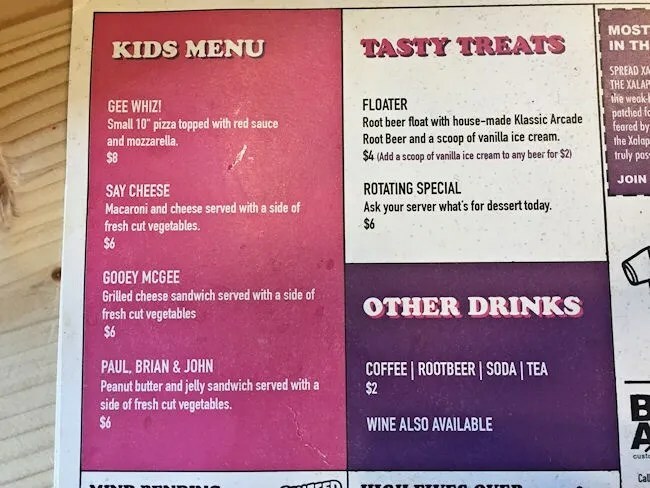 Heck, there’s even a great kid’s menu which includes a juice box. B just repeated “Juice! Juice! Juice!” to the bartender as we were trying to order. Eventually, the bartender stopped taking our order to go get him his juice box. We paid for our order, grabbed our drinks and the number, then went to find a table. One Well has two big dining rooms now. There’s the original dining room which was part of Sunset Boulevard. 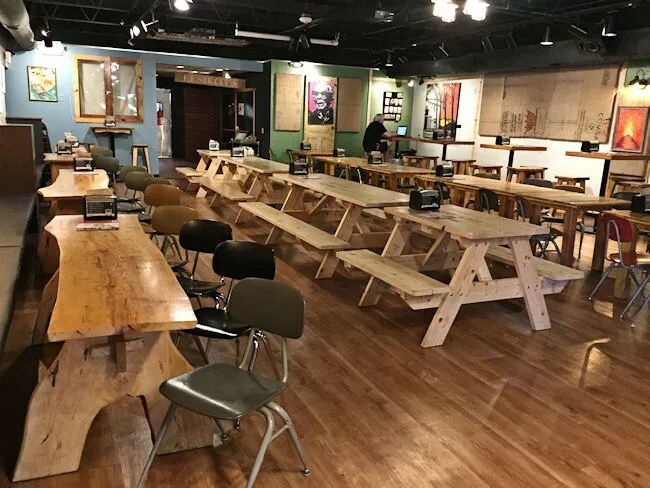 This space has picnic tables, hand carved tables with bench and chair seating and a row of pub tables near the back all sitting on top of a bright wood floor. There’s a lot of art hanging on the walls throughout the building. If you’ve ever seen their production brewery, you’d know these guys are really into some cool art. Back to the other dining room. This space is really, really cool. They turned this old gym into a giant playroom for both kids and adults. Just like the original dining room, there’s a lot of different seating options although most of the tables are picnic tables. There are a number of pub tables as well and there’s even a second bar for the nights when it’s really packed. 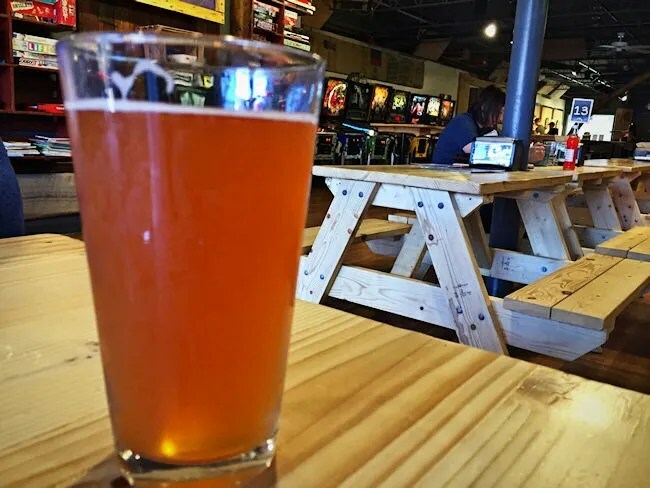 There are a lot of things to do at One Well besides just drink delicious beer. 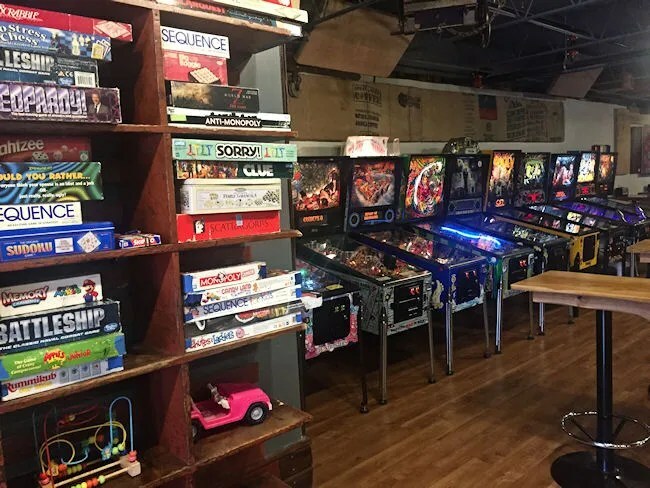 For the adults, they have a whole wall of board games that you can play for free, dart boards and a ten pinball machines that play for $.50 each. But what if you’re a kid and you don’t want to play Battleship or The Addams Family Pinball? No worries. 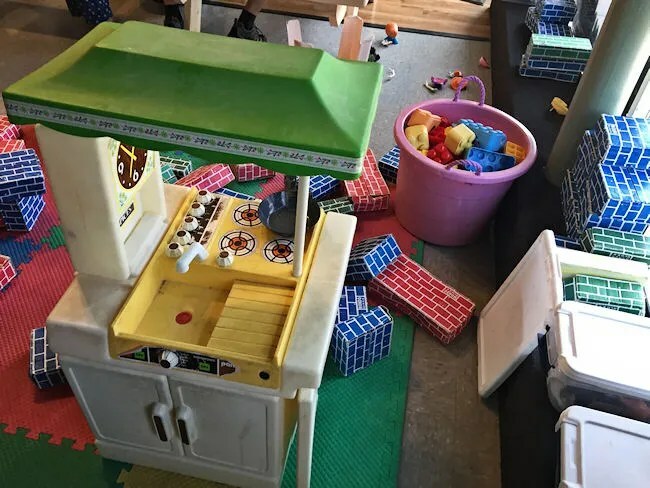 They have a great kids play area too with blocks to build with, a kitchen playset, a wall sized chalkboard, giant Connect Four games……. ….and a TV…with Netflix. 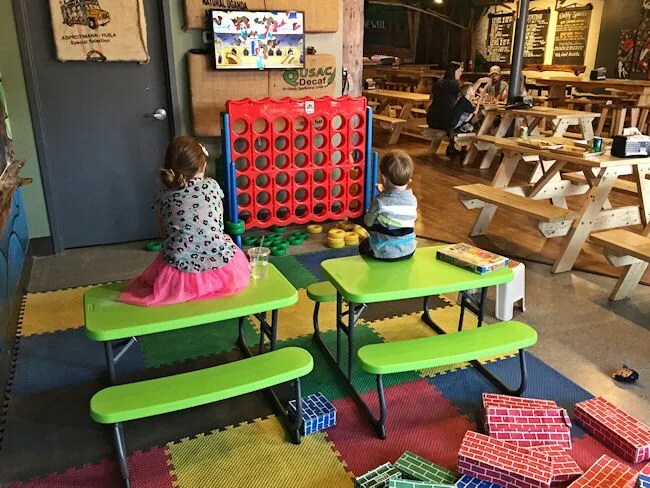 “Sing” was already playing when we got there and both kids sat on one of the plastic picnic tables watching it…despite the fact we have it on Apple TV at home and they used to watch it constantly. Oh wait, this is a food blog, right. I gotta get to that yet, but first, drinks. I’ve had quite a few of One Well’s beers and haven’t found one I didn’t like. I wasn’t really in a flight mood and since I’ve done one there before, I just went for a pint. I ordered an American IPA called Right Ripped. J was instantly drawn to a cider called Cherry Cherry Cider. A little tart. A little sweet. She really enjoyed it. I didn’t have much of a problem making my choice when it came to food. I was instantly drawn to the I’m Cuban, B! 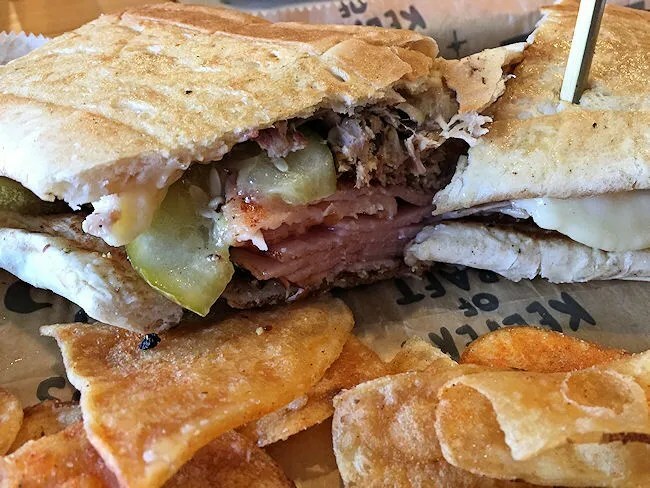 As the name implies, it’s a Cuban sandwich made with smoked pulled pork, Black Forest ham, white cheddar, stone ground mustard, and pickles. Holy cow, this thing was good. There was a lot of meat on this sandwich…a huge pile of the shaved ham topped by a another big pile of pulled pork. It was all pressed as tightly as it could be between thin, crispy bread. The mustard and pickles gave it a little bit of tanginess and that cheese was just melted and oozing out over the meat. The sandwich came with some golden brown home made kettle chips and a pickle spear. J ordered The Grilled Cheese Incident. 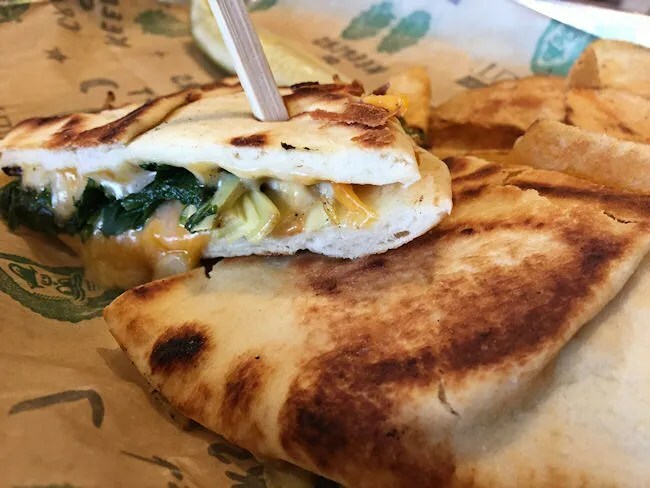 This take on a grilled cheese starts with Naan bread and is filled with smoked cheddar, mozzarella, provolone, white cheddar, parmesan, spinach, and artichoke as well as choice of bacon or chicken (J chose bacon). The five cheeses oozed out of the bread and J said it was kind of like eating a cheesy spinach artichoke dip. Her sandwich also came with chips and a pickle spear. We got both of the kids the Gooey McGee. 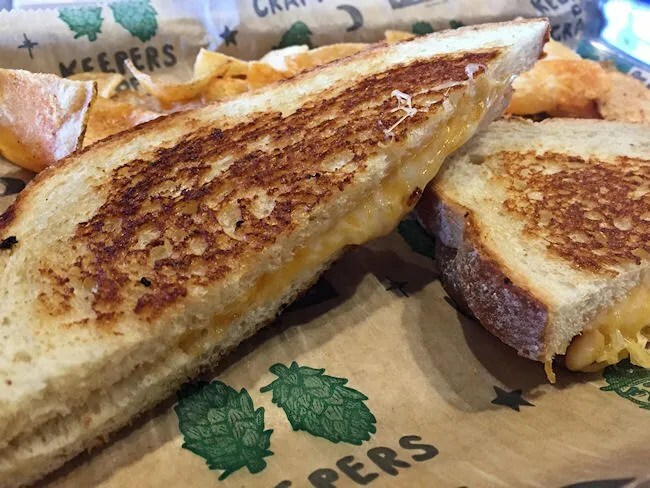 This is the kid’s version of the grilled cheese made with cheddar cheese and toasted bread. The kids were a lot more interested in playing than eating which was too bad because it was a deliciously simple sandwich. The kids get a choice of chips or veggies with their sandwich. Both of the kids took chips. So, yeah. That’s the new One Well Brewing. This place just shot right to the top of our rotation when it comes to eating out with the kids. Our bill for lunch was just under $40. We had a delicious meal. Great beers, and the kids (both the actual kids and myself) had fun playing video games and pinball while we were waiting for our food. 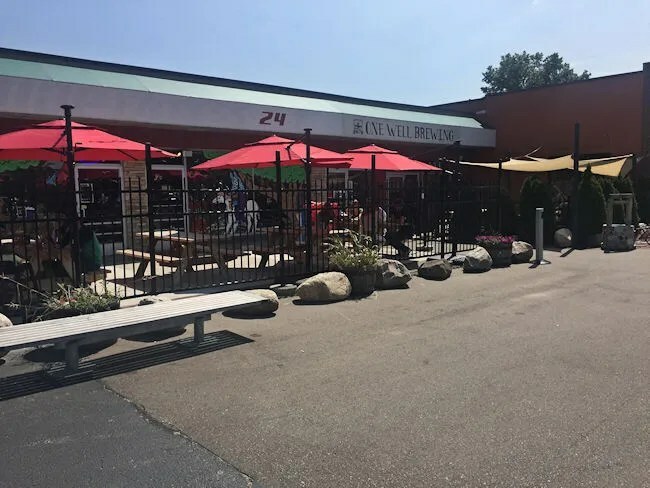 If you haven’t been to One Well in a while….or never….you’re missing out on something great here.